We turn to the great Gilded-Age American designer Louis Comfort Tiffany today, around the day he died in 1933, to focus on his largest contribution to St. Stephen’s, its chancel decoration of 1917, funded by Anna Magee as a memorial to her sister. Tiffany’s work in this category gets far less public attention than his windows and small decorative objects; that for St. Stephen’s, one of his last following another at Christ Church Cobble Hill, Brooklyn (1916), seems to be virtually unknown outside the church.The window screen fascinates me, given what I’ve learned of its original design. Its Islamic-inspired filigree once diffused the strong natural light coming in three tall, clear east windows to frame the stained-glass lights within that illustrate the life of St. Stephen. 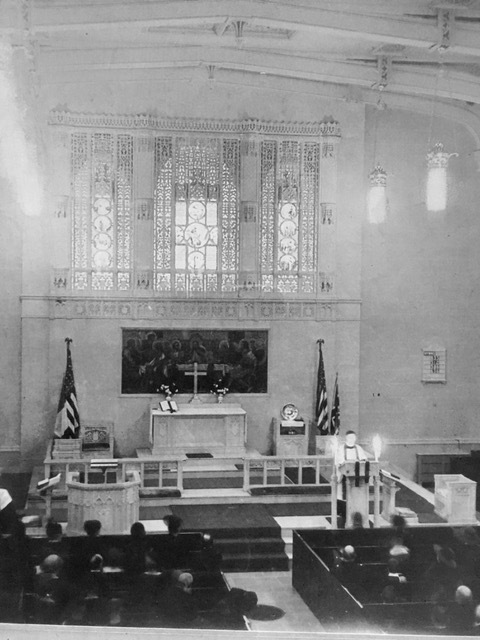 Tragically, the parish Community House next door burned down soon after Tiffany’s overall work in the sanctuary was complete (1923) and its replacement was attached to the church’s east wall, cutting off natural light. To compensate, the St. Stephen windows were backlit electrically, a growing early 20s approach to church windows. If only we could see the original design at work today! I show you a view taken during that precious eight-year “window” (1917-1925) to suggest how the screened window originally worked.